When a linear amplifier for the transmission is put up to the transceiver of amateur radio outside, the linear amplifier side should also switch sending and receiving by sending and receiving the transceiver. There is a thing thought to go well only by connecting it as it is made of the manufacturer the same, too and the person device is necessary when the sale time different and manufacturer are different and it makes by oneself. Because I had had a lot of rigs and linear amplifiers of V/UHF, the switch circuits of the sending and receiving were united by the simple expedient. In this any idea, the original one is what was nothing so far. 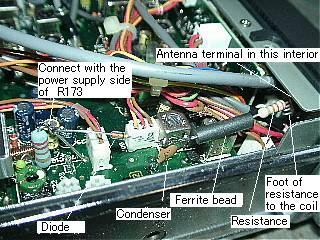 It similarly remodels when transformer barter FTV-901 of Yaesu Musen of 50/144/430MHz is used for the combination of HL-63U of FT-790mkII of Yaesu Musen of 430MHz and the Tokyo high-power and the main phone except introducing it here, it combines freely, and it uses it. It is a point that only the connection of the RF signal the miso of remodeling can ensure the switch of sending and receiving. Please use the linear amplifier described here without doing this remodeling with SSB. It is ..butter.. lucky, and the relay of the linear amplifier side must be anxious and be no use. Even if the mode switch of a linear amplifier is SSB, it uses it in the place of FM when remodeling it. Direct current is sent to the linear amplifier side (booster side) when transmitting from the main phone side (transceiver side), the direct current is detected on the linear amplifier side, and it adds to the RF detector circuit on the linear amplifier side. 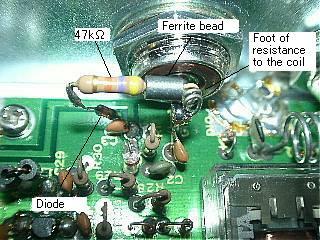 The RF signal is obstructed with the coil and the ferrite bead by using the foot of resistance though even only resistance and the diode are good. A blue part adds the circuit of a black part with an existing circuit. 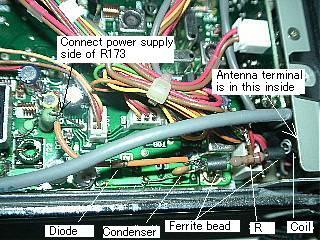 It is a method of remodeling the main phone for FT-690mkII of Yaesu Musen. If the lead wire side where R173 is long is used for the point that 12V is impressed when transmitting, it is possible to remodel it easily. It is possible to install firmly and to do though it is wiring in the air. It is an example of remodeling 50MHz50W linear amplifier HL-66V of the Tokyo high-power. Remodeling is easy. There is not a problem even if it is remodeled or it combines with other models either. This photograph is a method of remodeling the main phone for FT-290mkII of Yaesu Musen. If the lead wire side where R173 is long is used for the point that 12V is impressed when this is transmitted, it is possible to remodel it easily. 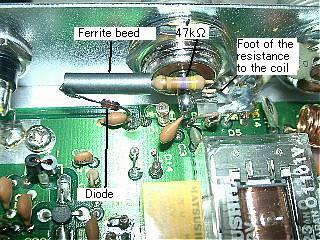 This photograph is an example of remodeling 144MHz50W linear amplifier HL-62V of the Tokyo high-power. Other models can similarly remodel it.